Short Detailed Information : Bihar Central Selection Constable CSBC Bihar Are Invited Online Application Form for the Forest Guard / Van Rakshak Recruitment 2019.Applicants should apply for Bihar CSBC Forest Guard Recruitment Online Form 2019 as soon as possible. 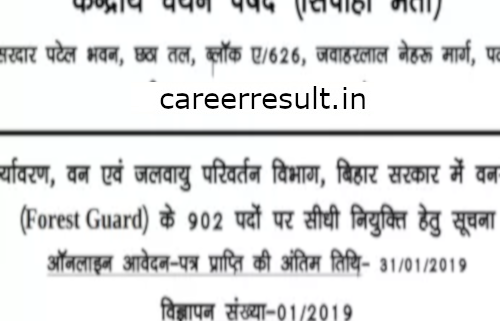 To get more details of Bihar CSBC Forest Guard Recruitment Online Form 2019 like Education Qualification, Age Limit, Selection Process, Important Dates/Events & other recruitment rules are given below…. For more details on Bihar Police CSBC Forest Guard Online Form 2019, check the official notification . How to Apply for Bihar Police CSBC Forest Guard Online Form 2019 – Candidates fulfilling the eligibility criteria can submit their online application through the official website of CSBC or through the Apply Online link given at the Important Links section. 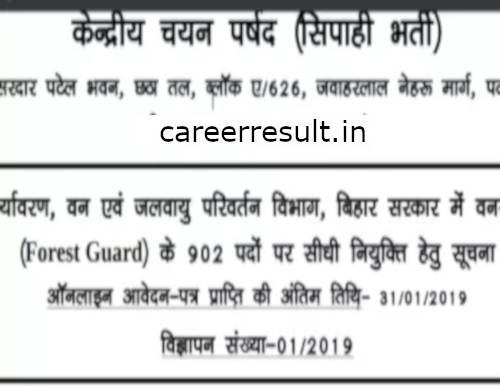 For more detailed info regarding to Bihar Police CSBC Forest Guard Online Form 2019 kindly visit official website and read carefully employment advertisement before applying against to Bihar Police CSBC Forest Guard Vacancy Online Form. Subscribe Careerresult to get latest updates about Bihar Police CSBC Forest Guard Recruitment Online Form 2019 on your smartphone via E-mail. For more latest jobs updates in Police Jobs Stay connected with us.All candidates have to request is to share this job link with your friends over at Whats App, Facebook,Twitter,Instagram and help them get good career in your life.